Henri IV was born in 1553 to the 16e century. The cradle of Henri IV is a gigantic Turtle shell surrounded of a helmet, spears and flags decorated each of blazons. A gold crown maintains spears, a golden heaume, surmounted of a white plume, dominate the all. Behind the shell there is a tapestry. There is also a bed where he slept when he was more aged. Henri's big parents offered the shell of turtle, the H is the initial of Henri III of Albret. The blue Japanese vases representing a bird in cage decorate the room of receipt, as well as a statue of Henri IV being a child (XIX century). A beautiful chimney sculpted throne to the bottom of the room. On this chimney rests a beautiful pendulum dating the time of Louis XIV. A chandelier hangs the ceiling majestically. This ceiling is formed of squares (ceiling to caisson), it is in ocher wood. On squares of the ceiling are written down the initial H and M, those of grandparents of Henri IV (Henri and Marguerite). Two big vases rest on tables, on these vases is written down a H (Henri). Vases are made in china of Sevres, they represent the installation of the statue of Henri IV in Paris on the Bridge-nine. A marvelous Dutch armchair welcomed Henri IV once. This room was the ancient Tinnel in the time of Gaston Fébus. 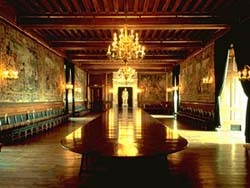 Of French origin, the table was installed to the castle under Louis-Philippe. Manufactured to drown some and in oak, the table at hundred covered can welcome hundred men and hundred covered as indicates him its name. Of oval shape, it measures 18m of long and 2m of large in its center. The table is entirely removable since calm on trestles. It is situated in the big lounge. The lounge is immense. A statue of Henri IV, surrounded of a sumptuous porch in sculpted stone, occupies the bottom of the piece. Five tapestries decorate walls. Big windows to the green curtains illuminate the piece. Magnificent chandeliers ornament the ceiling. About hundred chairs is aligned against the wall. The lounge is very impressive ! Beds to canopies have been manufactured toward 1400. One can admire some of it to the castle of Pau. It is beds with a " sky " . This sky is in sculpted wood. The sculpture is inspired directly of the architecture. When people went to bed, they saw beautiful cloths to the dark enough colors. 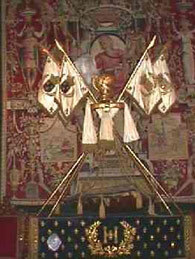 The tapestry is herself decorated of gold leaves. there is still on beds of pillows or bolsters because people slept seated. Beds were high. A stool to three marches permitted to reach the bed.